UK Poker News brings you part 2 of Oliver Boyce’s interview with one of Ireland’s bright young poker players, Cork’s Kieran Walsh. 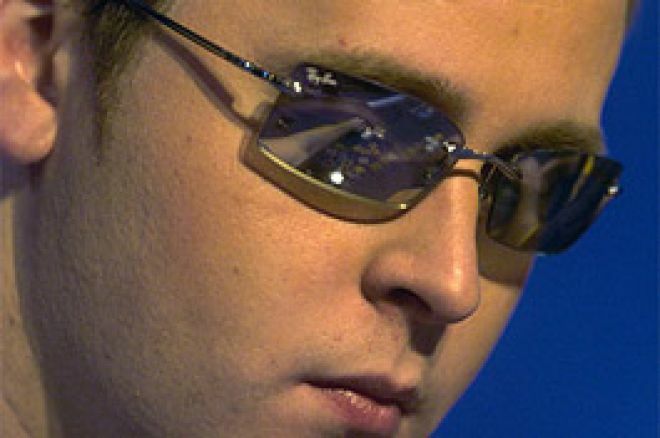 Kieran won the Irish Poker Tour Main Event in January 2006 at the City West Hotel, Dublin, also the venue for the following IPT event that has just finished with Brendan Walls taking the spoils. You will also be able to see Kieran at the Ladbrokes Poker Million on Sky Sports very soon. UKPN: During the latter stages of the IPT final in January, I believe a deal was discussed between you, Dave Masters and Damien Fletcher. There’ve been a lot of different stories flying around about this; what actually happened and how do you feel about it now? KW: We did try and chip up the money in relation to chip stacks but had agreed to give Dave a fair amount more. He declined the offer and wanted a 3-way even split. We - myself and Damien - holding twice Dave's stack, I decided that it wasn't in my interest to do this so we played on. Only a few hands later, I knocked Dave out when I filled a flush to beat his straight which he slow-played. Heads up, myself and Damien chopped up some of the money and played for a considerable portion as well as the trophy. UKPN: Deals between players on the final table are becoming the norm now, how to you feel about deals and what process do you use to calculate how fair a deal is? KW: I think with the huge sums of money now being paid out, players would be mad to not do a deal that benefitted them. Recently, I was involved in a 4-way chip-chop in Birmingham. The money I got (about £10,000) was equivalent to finishing 2nd. Chip chops are probably the fairest way to carry out deals but they do favour the bigger stacks and leave the short stacks with a raw deal. When doing a deal, don't think about anyone else except yourself. You are there to make money - as much of it as you can. UKPN: Has winning the tournament and playing against such highly regarded players in the last six months helped your overall game improve? KW: I think it's helped hugely. I think players expect more of me and I also expect more of myself. I've tried to educate myself in the finer parts of the game and also learn variations such as 7-card stud Hi/Lo and Razz. I feel that it helps me to be a more rounded player. UKPN: A lot of people in your native Cork would describe you as a cash player, tell us a bit about your cash success, what levels you play, how do you prepare for these games and what game plan do you have in general for cash that’s different from playing a tourney? KW: Like I said earlier, I have moved up through the ranks slowly and have been lucky enough to not have suffered any major setbacks. I started in the €25 Texas game in the Macau and playing $1/$2 online. From there, I moved to the €50 game and then onto the €100 round of each. Most of my success has come from omaha where I now play €5/€10 live and occasionally €5/€10 and €10/€20 online on pokerstars and Full Tilt. I'm not a huge online player but my swings can be anything up to €10K a day but overall, I'm winning at the moment. UKPN: We hear you’re planning a trip to Las Vegas to play in the WSOP main event. Are you planning to play any other events while there and have you been to Vegas before? KW: I can't wait! I've been to Atlantic City before so I have gotten the mini-Vegas rush but can't wait to get over there in July. I've decided to play about 5 or 6 hold’em events during my time there and, of course, my goal is to make a final table!! UKPN: Not happy with winning the IPT, you’ve now won your seat to play in the Ladbrokes Poker Million next month and I believe you don’t play online much, how did you win your ticket? KW: I probably play about 10 hours a week online but one day I just fancied giving the qualifier for the Poker Million a shot. I stumped up the $950 entry and luckily, everything went well on the day and I won a seat along with €15K in cash. UKPN: How do you find the general poker scene in Cork and Dublin for tourneys and cash? KW: Ireland has produced some fine poker players over the years and obviously most of them them tend to gather in the big cities. Both cities have great casinos with fantastic facilities for any player wishing to take up the game. Fintan Gavin of www.pokerevents.ie has done a fantastic job promoting the game all over Ireland with weekly tournaments in every town and city he could possibly fit in! UKPN: Roy Brindley also said some of the best Omaha cash players can be found in the Dublin casinos. I know you’re a big Omaha player, what do you think makes a winning Omaha player? KW: I know Ireland has produced some fine players (Denis Winters springs to mind) but I'm not really in the Dublin scene. In Cork we have a few competent players but generally, the cash games are a good place to be! UKPN: Since your win you’ve been travelling and playing events all over Europe. Tell us about some of them and any good cashes that you’ve made since and how do you find life as a full-time poker pro? KW: I've been lucky enough to travel to the UK many times lately for events and also got to go to the E-WSOP in Vienna with the Irish team. That will stand out as the event I enjoyed the most even though I didn't cash. I won (well, split) the £500 double chance in Birmingham and also cashed in the £300 freezeout in the Vic in London. I also had my best week ever in live cash games there. UKPN: Being a full-time poker player must have created a negative reaction from your family and friends, how did they handle the news and how did they react to your big win last January? KW: Actually, they're really supportive! They didn't know I played nearly as much as I did before winning in Dublin but now they've taken to it well. My dad's even giving it a go! UKPN: What do you think the negative aspect of being a poker pro is and what positives do you find? KW: The negative is definitely the travelling and the long, unsociable hours. Being away from family and home so much takes its toll and that can affect your game. The positive is the flexibility in your life and if you're winning, it can be very financially rewarding. UKPN: We are now on the eve of the next IPT main event which has increased the buy-in to €3k and is now extended to a 5 day event, how are you preparing for the main event and will you play in all the events? KW: I have taken the last month or so off and only played a little online. I just felt I was totally burned out. It's done me the world of good. I only plan on playing the main event as I'm flying to Spain on holidays with a few friends as soon as I'm knocked out! KW: It's hard for me to really know as I learned the game live but many internet players have taken to live play really well (Ben Grundy being a good example). I think the hardest adjustment to make is to the speed of the game. The hands per hour are considerably slower live than online. A lot of people make a big deal of physical tells but personally, I'm not that convinced. I think the timing and betting patterns can be analysed more accurately live and intimidation plays a huge part. I suppose my advice would be to try and adapt to the conditions slowly and also to remember that tourneys and cash games are two separate disciplines. Just because you have a good grasp of one does not mean that you will be instantly successful in the other. UKPN: Finally, Kieran, after such an exciting year, what are your goals in poker for the longer term? KW: First off, I'd give anything for a result in the Poker Million. I'm also going to continue keeping a good account of my travels on my website www.kieranwalsh.com. Long term, if I can continue travelling, playing the game I love while having a fantastic time, and continue making great friends all while making a few quid along the way, I'll have far surpassed my wildest dreams. UKPN: Kieran Walsh, it has been good to talk. Maybe we can catch up with you after the Poker Million or the WSOP. Thanks for your time and UK Poker News wishes you every success in poker. KW: Thanks Ollie, hopefully we'll meet again at a final table some time!